Pain from auto and car accidents can linger for years if its cause is not corrected. Almost all Americans will be involved in at least one motor vehicle accident at some time in their life. Often we are able to walk away free from injury… or so we may think. Learn about the little noticed symptoms that can result in permanent pain and discomfort if their cause is not corrected. Injuries that result from a motor vehicle accident are often not diagnosed correctly. Frequently, the pain or other symptoms of the injury are not apparent at the time of the auto accident. In fact, some auto injuries are hidden so well, they may be missed by emergency room technicians and could take weeks, months, and even years before actual symptoms show. 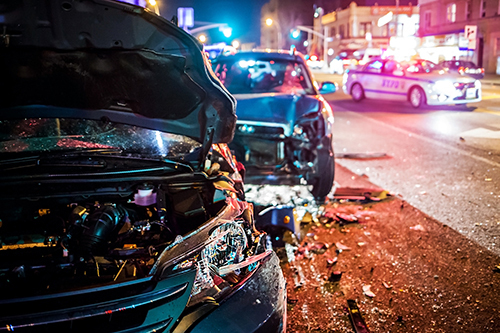 The amount of damage to the vehicles in an auto accident does not depict the amount of injury sustained by the victim. Studies indicate that injuries can occur at impact speeds of 5 mph where there is little or even no damage to the car. Today’s cars absorb much of the impact in the bumper but transmit this energy from an impact to the person’s head and neck in much the same fashion as when one pool ball hits another. A whiplash injury happens when a person’s head is suddenly snapped forward, then backward. The symptoms of whiplash are headaches, stiffness, and neck pain. Blurred vision and tingling sensations in the arms and shoulders are caused by irritation to the nerves, caused by even a slight misalignment of the vertebrae in the neck. Almost every person involved in an automobile accident suffers some degree of whiplash injury. The most common symptoms of a whiplash injury are pain or stiffness in the neck and shoulder, recurring headaches, numbness in the arms and fingers, irritability, back pain, and dizziness. Few people realize that an untreated neck or back injury from a car accident is likely to develop into the degeneration of the joints in later years.